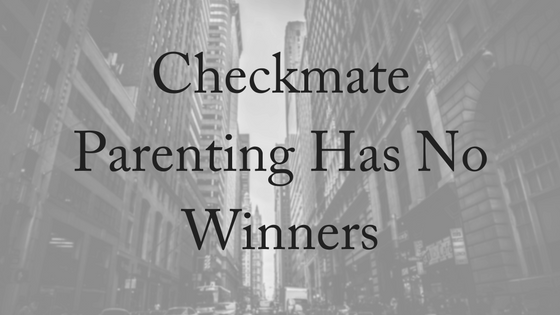 What is checkmate parenting? 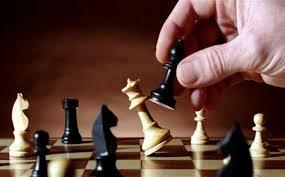 Divorce should not be a chess game with the children used as pawns. And yet that seems to be what happens way too often for the ones who are the most vulnerable. While the white King and the black Queen are fighting it out, the poor pawns are used to defend their own moves or are pushed aside for more powerful pieces to gain a better position over the other. Penelope Leach is said to be one of Britain’s leading development experts and at 76 she has been studying children for quite a while. She says we are in the middle of an epidemic – a relationship breakup epidemic – where the victims are the children of those relationships. Although it’s not the obvious hurt and disability of a missing limb, she says it is just as life-changing and far-reaching. More than half of all children are affected by this epidemic by the age of 16. That’s a lot of children. And when they are the victims of checkmate parenting – where each party fights at all costs to win – science tells us that the children do worse. Because we live in the real world we know that divorce is a fact of our society. But what we haven’t got right and we often do have some control over is doing divorce better. Says Leach: “If you can no longer be a wife, a husband or a partner, you must remember this: you will always and for ever be a mother or a father.” This needs to be the priority as parents split-up, instead of children “being used as weapons in the marital war when actually they are its victims, ” says Leach. The bottom line, says Leach, is this: parents matter and the more research psychologists and neuroscientists do, the more we realise that they matter even more than we knew, that their influence is even greater than we once imagined, and that it continues for even longer than we thought. 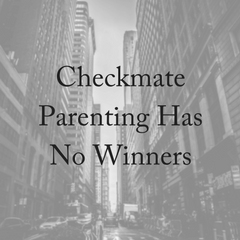 We can choose not to get caught up in checkmate parenting. Divorce doesn’t happen in a vacuum. By the time people are ready for divorce there has often been a gradual build up of anger and resentment. Most marriages do not end with the ex-spouses being friends, although it does sometimes happen. Having children to consider and look after doesn’t always seem to have much of an impact on the behaviour of these warring parties. Vengeful parents are unaware or uncaring of the way their behaviour impacts their children when they are witness to it. It doesn’t even have to be a tirade of verbal abuse that has an effect on developing minds, but even just the demeanour and tone of voice towards the ex-spouse speaks volumes and leaves its corrosive residue on fragile hearts. When children have to deal with parents checkmate parenting, they don’t feel heard or understood and often unsafe. 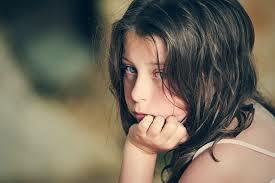 Being caught in the middle of parental conflict and being used as pawns is damaging psychologically and emotionally. But when children are shielded from conflict and co-parenting is child focused, then children are much more likely to grow and bloom. How we decide to parent is a choice. We may not control the circumstances under which we parent, but how we respond to them comes from within us. We are highly experienced in making divorce as low conflict as possible, and making sure that the children’s best interests are put first at all times. We help negotiate parenting arrangements with a view to preserving the relationship between the children and both parents, where possible. Our experienced family lawyers are practiced at helping divorcing parents to formulate child centered parenting agreements. We offer a free, 10-minute phone consultation. Please contact us today.